On this week's episode of SmackDown Live, we witnessed yet another rap battle in the build-up to another SmackDown Live Tag Title match between The Bar and The Usos. With The New Day serving as judges for this one, this rap battle didn't quite turn into a feisty one like the last time. Nonetheless, in what was their debut as a rap duo, the team of Sheamus and Cesaro certainly did manage to win over the WWE Universe despite their terrible rapping skills. One man who also had his say was non-other than legendary rap artist Vanilla Ice. American rapper Vanilla Ice released his debut album, Hooked, in the year 1989 on Ichiban Records before eventually signing a deal with SBK Records, a record label of the EMI Group, which later released another version of the album billed under the title of To The Extreme. His 'To The Extreme' album contained the Ice Ice Baby song and was the first hip-hop single to top the Billboard Charts. 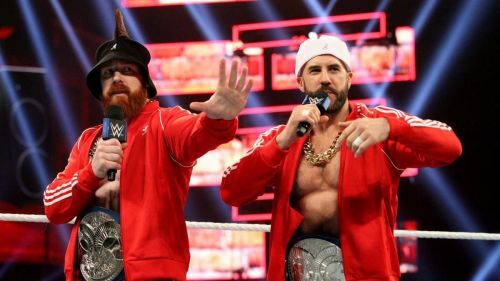 During last night's edition of SmackDown Live, the duo of Sheamus and Cesaro stepped out of their comfort zone, as they participated in a rap battle against the evergreen Usos, who as usual dropped some heavy bars on The Bar. Despite not being the best at rapping, The Bar, who on the night was influenced by Vanilla Ice, decided to present a rather hilarious version of his iconic Ice Ice Baby song, labeling it as Ice Ice Sheamy. This eventually caught the eye of the man himself, as Vanilla Ice himself on Twitter appreciated The Bar's flow, stating that their rap game was so bad last night that it eventually turned out to be awesome in a hilarious manner, of course. The Bar will be defending their SmackDown Live Tag Team Titles against The Usos and The New Day in a three-way match, later this week, at the Tables, Ladders, and Chairs pay-per-view. What did you think of The Bar's rapping skills? Do you wish to see them in more rap battles in the future or would you like to stick them to in-ring competition only? Let us know below in the comments! WWE Rumors: Sheamus not on SmackDown with Cesaro because he's injured?